Posted on Fri, Jan 27, 2012 : 9:42 a.m. File photo of a team preparing for last year's robotics competition. By: susan weir: Skline Robotic Team Kicks off! Skyline High School FIRST robotics team 3322 joined an estimated 60,000 around the world for the National 2012 FIRST robotics Competition 2012 kickoff Saturday, Jan. 7, at Washtenaw Community College. The Michigan Philharmonic presents "Sunday with Schubert" on February 12, 2012, featuring the orchestras’ principal Clarinetist, Lisa Raschiatore, who will perform Aaron Copeland's jazzy "Clarinet Concerto." Sat, Jan 28, 2012 : 7:49 p.m. The picture used in this article, is actually NOT a Skyline high school student. 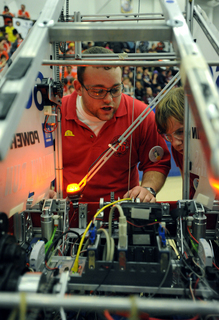 That is Tommy Means, Mentor and alumni from Willow Run High School's Team 66 robotics team. Also in the photo is Alumni Edward Calhoun. I too am a proud alumni of Willow Run, and a former team mate of Team 66.